1200 FDC Switzerland - 1955 / 2000, extensive collection of approximate 800 illustrated First Day Cover with numerous sought-after issues, Pro Juventute and Pro Patria sets, blocks of four, many beautiful subjects and so on. Up to embroidery stamp 2000 collected. Enormous catalog value respectively acquisition price! 1410 ⊙/ / Switzerland - 1850 / 1977, rich collection in two Lindner hingeless printed form ring binder with many good issues from the classic formed. As well Rayon stamps with better values, Strubel, seated and standing Helvetia, with also various perforations, numerous Pro Juventute sets from 1915, good souvenir sheets issues from the forties and fifties, with also Pro Juventute souvenir sheet 1941, Bale dove souvenir sheet 1945, war victims souvenir sheet 1945 with special cancel, PAX set 1945 used, LUNABA-block 1951 with first day special cancel, butterfly tête-bêche sheet 1953 and much further material. A rich object with very high catalogue value! 1419 ⊙ Switzerland - extensive used collection housed in two large stockbooks with numerous good issues. 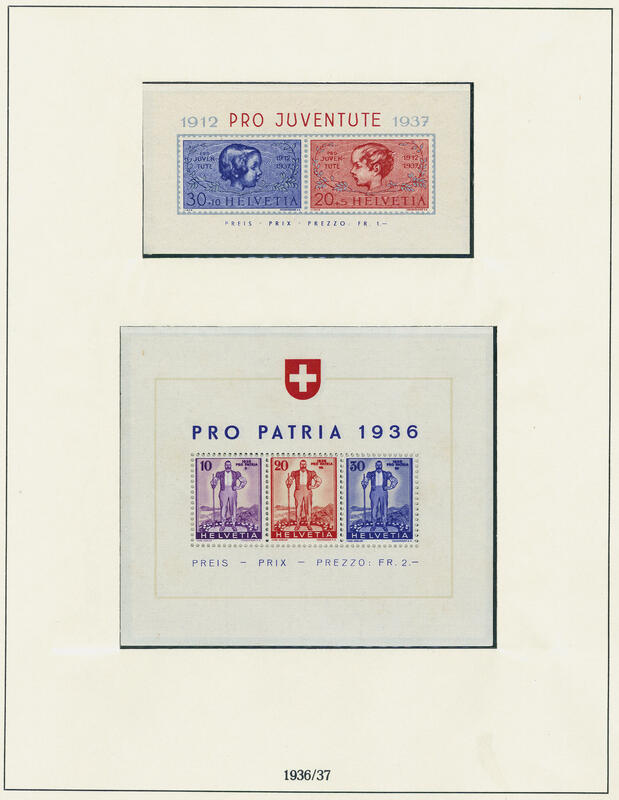 As well an extensive part Pro Juventute issues including the forerunner from 1912 with German and French inscription, all sets from 1915 / 88, Pro Juventute souvenir sheet 1941, an extensive part Pro Patria, with also the Pro Patria-block 1936 neat cancelled furthermore many good souvenir sheet issues, with also NABA-block 1934 with appropriate special cancel, Pro Juventute souvenir sheet 1941, LUNABA-block 1951, Double Geneva souvenir sheet and Zurich souvenir sheet on covers, an extensive part airmail stamps with better values and sets, with also various paper types, a nice part twenties and thirties, PAX set 1945 neat cancelled and so on. A magnificent object with very high catalogue value! 1420 / Switzerland - very nice and rich collection in two large stock books formed with a lot of better issues. Also the Pro Juventute precursor series 1912, further good sets Pro Juventute, all values mountainscapes including 3 Fr. Myths green, the set Helvetia with sword (key value double), an extensive part airmail issues, as well better sets from the twenties and thirties, various paper types, both airscrew overprints, a strong part souvenir sheets, with also NABA-block 1934, Federal celebration souvenir sheet 1940, war victims souvenir sheet 1945, further good souvenir sheets from the forties years, LUNABA-block 1951, the PAX set 1945 and so on. A very nice and Cultivated object with very high catalogue value! 1472 ⊙ Switzerland - extensive lot on stock cards with numerous older issues, mixed quality, with a lot of older material. As well for example also a good part Strubel values including two copies the 1 Fr., as well further denomination value, seated and standing Helvetia with better values, good perforations, cross / numeral, airmail stamps with better values, Bale dove souvenir sheet with red special cancel and so on. Enormous catalog value! 1497 ⊙ Switzerland / standing HELVETIA - extensive special collection of the issue standing Helvetia en masse album formed. 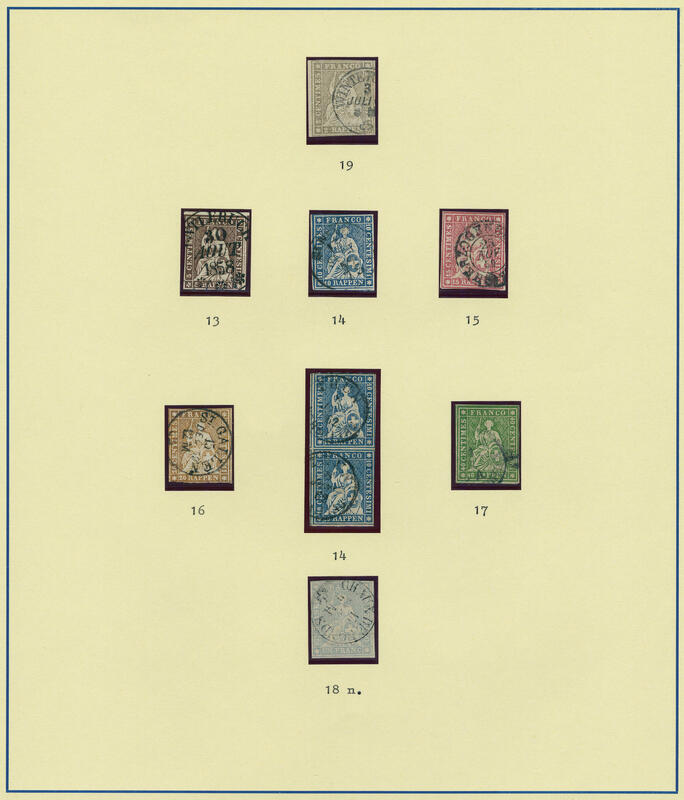 Many better values, good perforations, color shades, 20 so-called Parisian reprints unperforated on ungummed paper in different colours, 30 Rp. With plate flaw \"HELVETTA\", perforation varieties, plate flaw and so on. An interesting object of this popular issue! 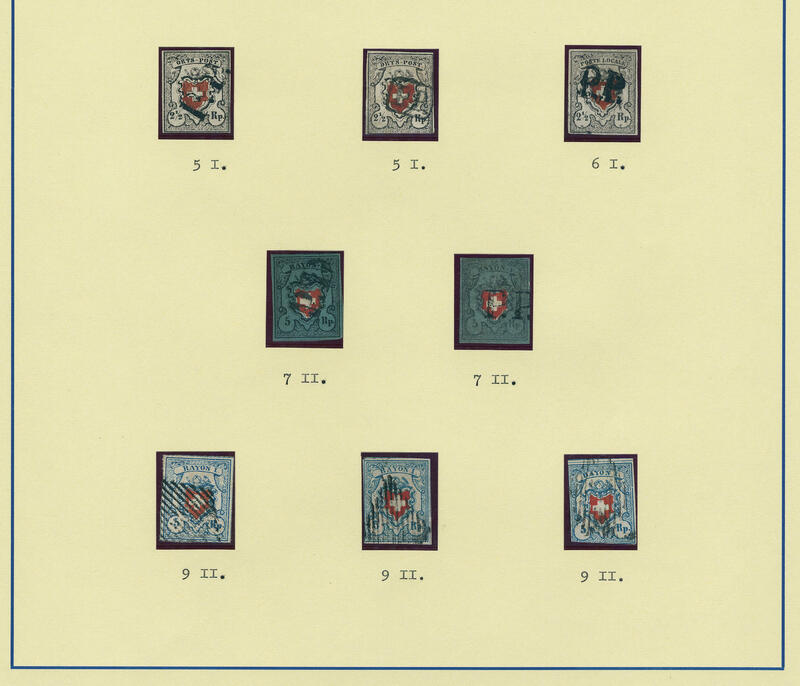 1572 ⊙ Switzerland - extensive used lot in a large stockbook with numerous different issues, as well a good part Pro Juventute including the sets from 1915 and 1917, coat of the arms sets and so on. Favorable! 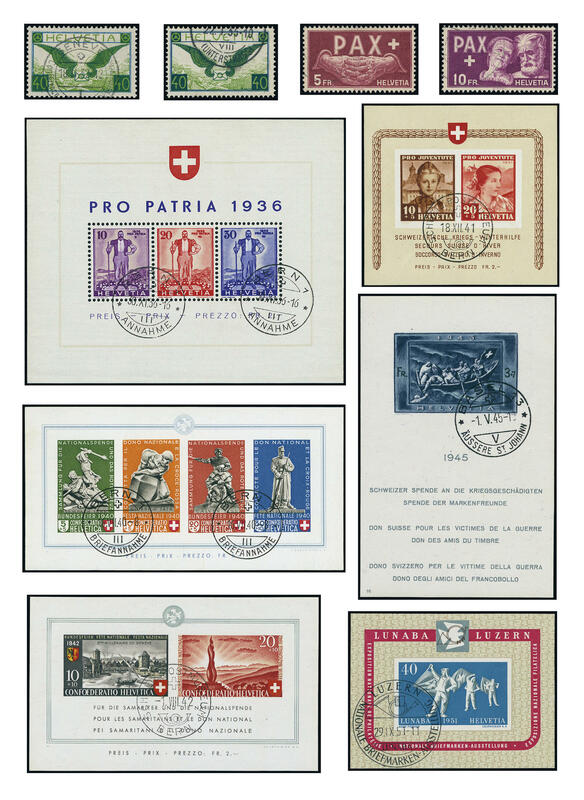 1606 ⊙ Switzerland - 1960 / 2012, extensive used collection in four beautiful claret Lindner T hingeless printed form ring binder with numerous special- and commemorative sets, Pro Juventute, Pro Patria, souvenir sheets, complete volumes and so on. Enormous catalog value! Original price the albums already approximate 500,- Euro. 1607 ⊙ Switzerland - extensive used collection blocks of four with centric postmarks, mainly from first day in two Lindner ring binder. 1608 x Switzerland - interesting lot in five albums and one sheet folder accommodated. With also offices issues, older values Tell / Tell boy and Helvetia with sword, a complete used collection from 1965 / 89 in the Lindner T hingeless printed form ring binder and so on. Very favorable! 1626 /⊙/ Switzerland - 1907 / 60, nice and rich collection, clean made up in the Biella spring back binder. As well numerous complete sets, older issues, special- and commemorative sets, an extensive part Pro Juventute with all sets from 1915 / 16 and 1918 / 60, Pro Juventute souvenir sheet 1941, various se-tenants Pro 1953, an extensive part Pro Patria, with also the Federal celebration souvenir sheet 1940, as well also the souvenir sheet issue from 1942 and so on. Favorable valued collection with high catalogue value! 1653 /⊙ Switzerland - 1882 / 1963, rich collection in the KABE illustrated album. 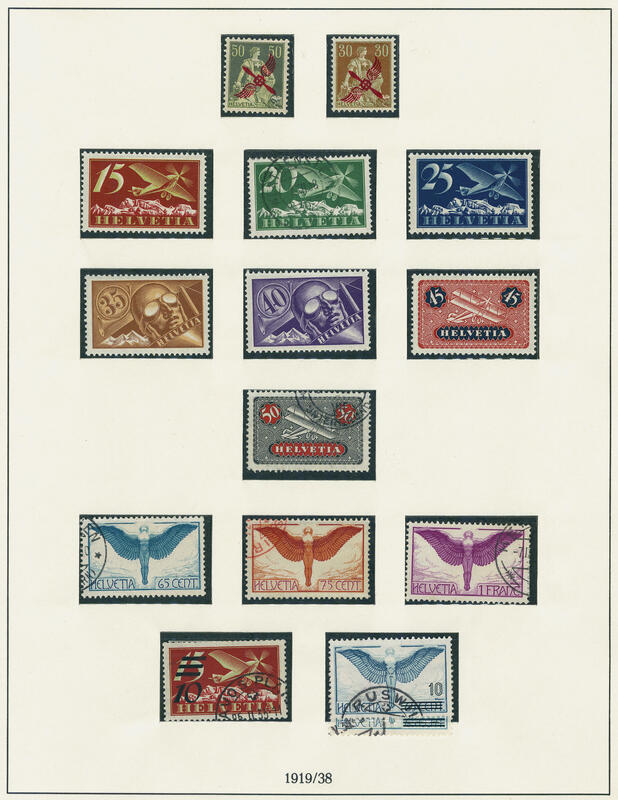 With numerous older issues, seated and standing Helvetia, all Pro Juventute sets from 1915 / 63, good airmail stamps from the twenties and thirties, Pro Patria-block 1936 used, Federal celebration souvenir sheet 1940 in perfect condition and perfect used, Pro Juventute souvenir sheet 1941 very nice canceled, Federal celebration souvenir sheet 1942 neat cancelled, both Zurich souvenir sheet 1943 with red special cancel, Double Geneva souvenir sheet with red special cancel, PAX set 1945 neat cancelled, war victims souvenir sheet 1945 nice canceled, Bale dove souvenir sheet 1945 with red special cancel, Imaba souvenir sheet 1948, LUNABA-block 1951 with appropriate first day special cancel and many further issues. A wonderful quality object! 1689 GeF.Heft Switzerland - interesting lot of PTT booklets in mixed sizes with numerous different issues including blocks of four from the fifties, with also blocks of four with centered first day cancel`s, booklets with numerous different issues, partly with useful issues, also the good maximum card from 1956 5 Rp. Mail bus and so on. Very high trade value! 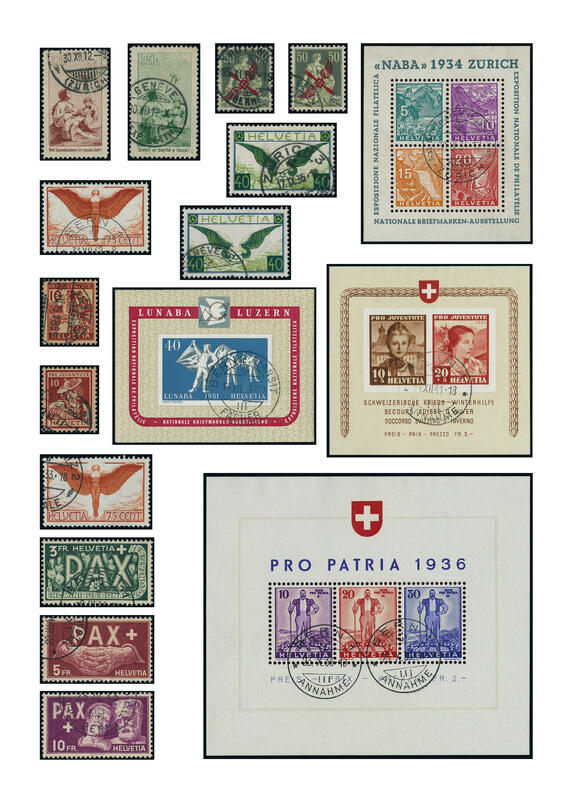 1692 /⊙ Switzerland - 1938 / 69, rich collection in the safe hingeless printed form ring binder with plenty of better issues, many complete sets, as well good souvenir sheets. With also Pro Juventute souvenir sheet 1941 mint never hinged, Federal celebration souvenir sheet 1942 mint never hinged, both Zurich souvenir sheets 1943, Double Geneva souvenir sheet mint never hinged, Bale dove souvenir sheet 1945 mint never hinged, Imaba souvenir sheet 1948 mint never hinged, Lausanne souvenir sheet 1955 with first day special cancel and many further issues. Favorable! 1720 Switzerland - nice mint never hinged collection with issues from the fifty and sixties years in the Lindner ring binder. As well numerous complete sets, complete volumes, Lausanne souvenir sheet 1955, butterfly tête-bêche sheet 1953, official stamps from 1938 with complete mint never hinged sets and so on. Favorable! 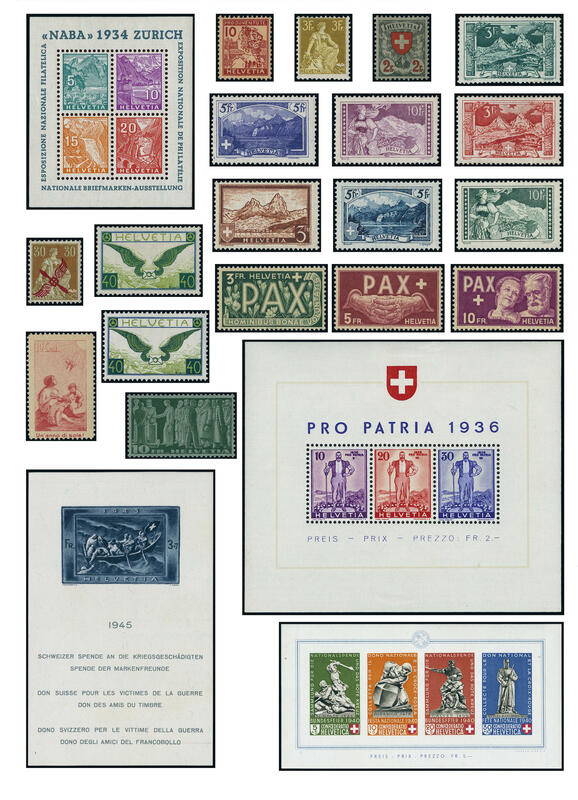 1721 ⊙/✉/ / Switzerland - 1850 / 1938, rich collection, nearly complete and mainly used collected with numerous expensive issues, from the classic, slightly mixed condition, with many superb and extremely fine copies. With also 2 ½ Rp. Local post with framed cross, with different cancellations, 2 ½ Rp. 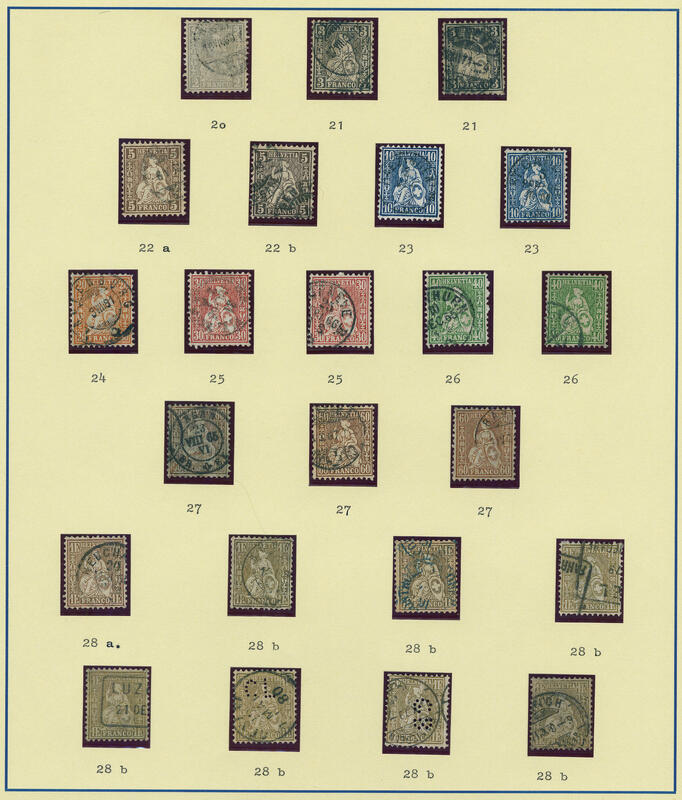 Poste Locale with framed cross, Rayon stamps well-staffed, with also two examples the 5 Rp. Blue / red / black without framed cross with different cancellations, all further Rayon stamps, with also variety with different cancellations, color shades and so on. Also a good part Strubel exist with rarely values. As well all denomination value, also better prints and so on. 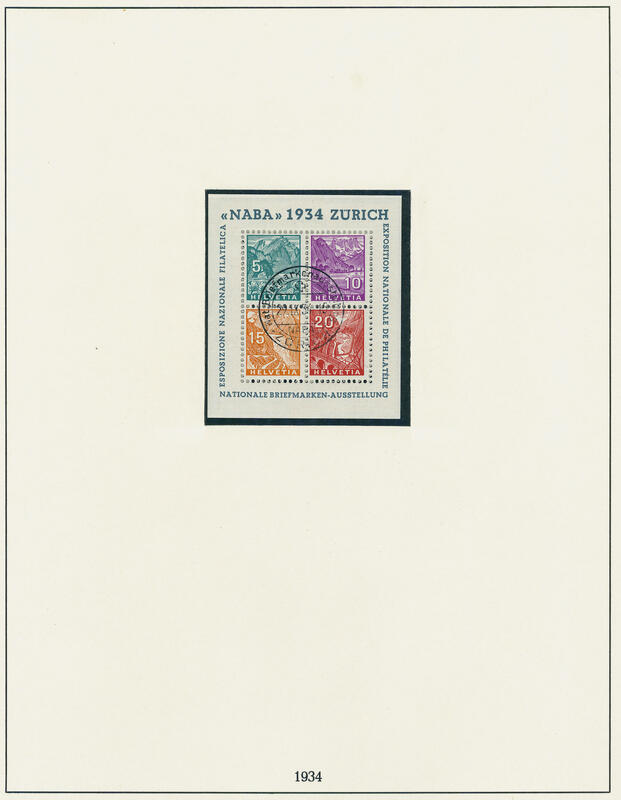 Partly with short attests, as well also seated and standing Helvetia with good issues, Pro Juventute sets from 1915, airmail stamps including the both airscrew overprints and further better sets, NABA-block 1934 with special cancel and further better issues. Enormous catalog value! 1779 ⊙/ / 01. 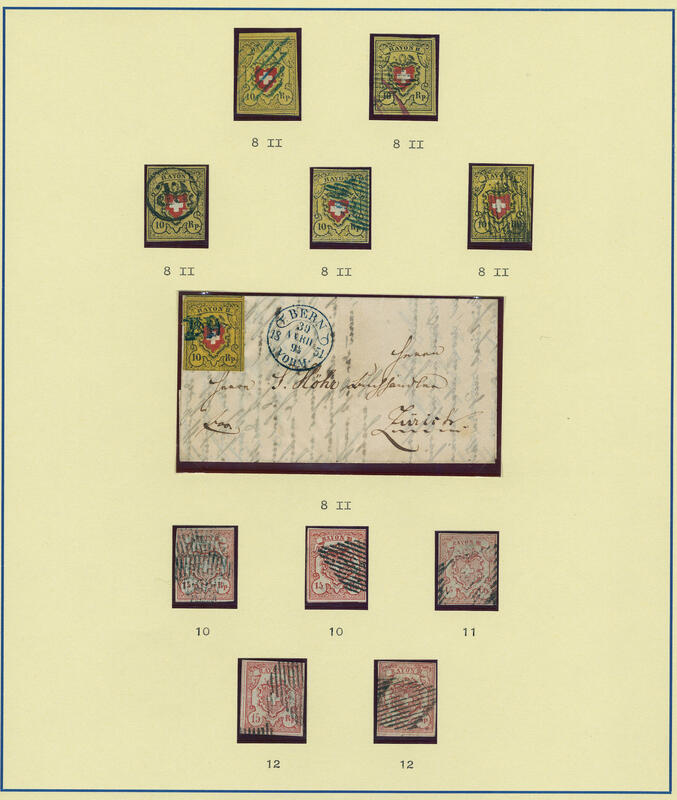 Aug Switzerland - interesting collection the offices issues in a large stockbook. As well numerous various issues, complete sets, World Refugee Organization Michel no. 1 / 8, as well also postage due stamps and so on. Favorable! 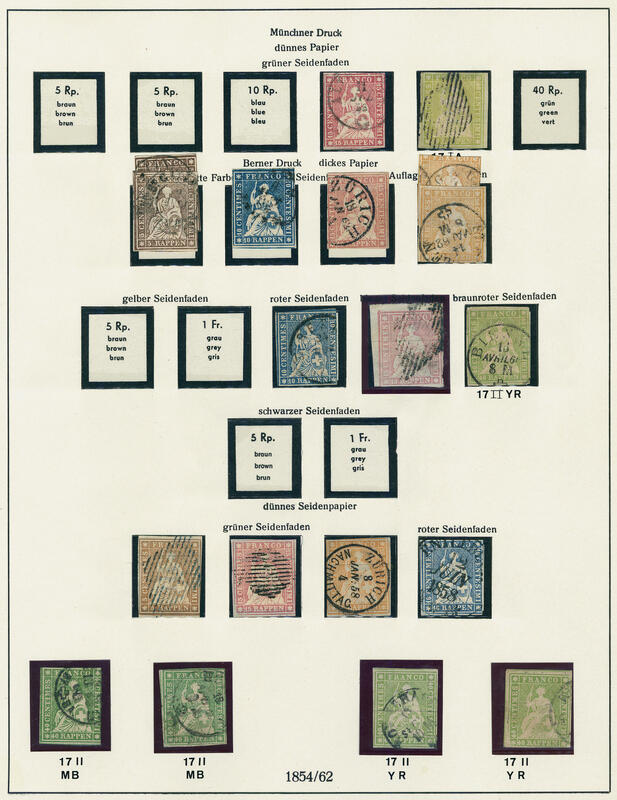 1876 ⊙/ / Switzerland - 1850 / 2014, interesting and rich collection with plenty of better issues in two large stock books formed, predominantly in used condition, a little mixed, mainly good condition with plenty of better issues, as well Rayon stamps, Strubel, seated and standing Helvetia, 30 Rp. Airscrew, good Pro Juventute sets from 1915, better airmail stamps the twenties and thirties, NABA-block 1934 on piece, Pro Patria-block 1936 used with certificate, Federal celebration souvenir sheet 1940, Pro Juventute souvenir sheet 1941 in both conditions, both Zurich souvenir sheets, war victims souvenir sheet 1945 used and on cover, Bale dove souvenir sheet with red special cancel, PAX set 1945 neat cancelled and 3-5 Fr. PAX once again mint never hinged, Imaba souvenir sheet 1948 twice on illustrated cover with different cancellation dates, LUNABA-block 1951 with special cancel, Lausanne souvenir sheet 1955 on registered cover and lots of further material, special- and commemorative sets, souvenir sheets and so on. A magnificent object with enormous catalogue value! 1890 Al✉um Switzerland - 1945 / 79, as good as new lighthouse hingeless illustrated album complete. Original price approximate 150,- €. 1924 ✉ Switzerland - extensive lot of covers and cards packed in a carton. Thereby many interesting documents, older material, better airmail documents from the twenties and thirties, Pro Juventute souvenir sheet 1937 multiple on covers, Federal celebration cards, Zurich souvenir sheet 1943, Federal celebration souvenir sheet 1942 on cover, Lausanne souvenir sheet 1955 on card, LUNABA-block 1951 on cover, Bale dove souvenir sheet 1945 with red special cancel on cover, war victims souvenir sheet 1945 on cover with red special cancel, two covers with Lausanne souvenir sheet 1955 and so on. Interesting treasure trove!